MacKenzie Commercial Real Estate Services, LLC is proud to announce that recent leasing activity at Box Hill Corporate Center in Abingdon, Harford County, Maryland, has brought one building to 100% occupied and kicked off the construction of another. Maryland Vascular Specialists, Inc., Maryland’s trusted specialist in providing compassionate, innovative, and conservative vascular treatments and wellness, signed a lease for the remaining 2,000 square feet at 3401 Box Hill Corporate Center Drive, bringing the building to 100% occupied. 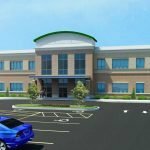 Neighboring 3400 Box Hill Corporate Drive, a 26,000 square foot office building, began construction last week with the recent signing of Kaiser Foundation Health Plan of the Mid-Atlantic States, Inc.’s 20,816 square feet lease. MacKenzie’s Beetle Smith and Tom Mottley represented the landlord in both transactions. James Silfee, III of Colliers represented Maryland Vascular Specialists and Clare Berrang of JLL represented Kaiser. Box Hill Corporate Center is Harford County’s largest mixed-use development. Situated less than one mile from I-95, the development is adjacent to the premier offerings of Boulevard at Box Hill and provides tenants and visitors easy access to additional amenities within a short distance. For leasing inquiries contact Beetle Smith at 443.573.3219 or bsmith@mackenziecommercial.com, or Tom Mottley at 443.573.3217 or tmottley@mackenziecommercial.com. For more information on MacKenzie, please visit www.mackenziecommercial.com.